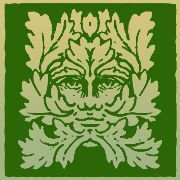 All Green Man and Gatekeeper designs are created by author, illustrator and sculptor Clive Barrett. Working in a converted farm building on the picturesque Lydney Park Estate, situated between the Forest of Dean and the River Severn, he draws his inspiration from his interests in history, mythology and Folk Lore. The designs - figures, jewellery, leather carving and greetings cards - featured on this web site are created in the Green Man and Gatekeeper Workshop. The ceramic sculptures are made in our ceramics studio - the Green Man Pottery. We also sell a selection of carefully chosen items to accompany our own designs.